Some of them are big names while others are relatively unknown but who worked marvelously in the background. Here, in no particular order, are 2012’s Top 12 Ilocanos meticulously picked by the editorial board of The Ilocos Times, the oldest and largest newspaper in the North. 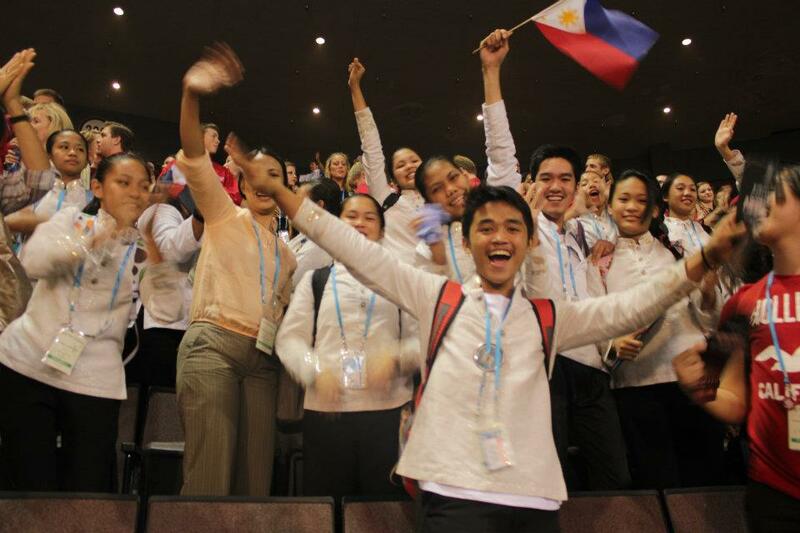 Based at the Ilocos Norte National High School, this multi-awarded choral group bagged their most prestigious feats to date: The Gold IV award in the Folklore Category (Open Competition) and Silver Medal in the Musica Sacra Category (Champions Competition) in the 7th World Choir Games in Cincinnati, Ohio—considered the Olympics of choral competitions. Samiweng’s sister group, The Laoag City Children’s Choir, also emerged back to back Grand Champion (2011 and 2012) in the MBC Choral Competitions. More than the awards, however, it is the inspiration they give Ilocanos that really counted. Samiweng has generously shared their collective talent in various events and venues, each time triggering goosebumps and eliciting thunderous applause. With a hands-on governor whose dynamism shows in her comprehensive programs, most notably in agriculture, trade and commerce, and tourism, Ilocos Norte today is one of the best performing provinces in the country. Her initiatives in education keep the province on track with the Millenium Development Goals. Also, Ilocanos shined this year in both sports and cultural events. Her constituents’ morale is high, and there is wide approval on the transforming Ilocos Norte landscape. His highly logical, highly entertaining “Palusot” Summation Speech was highly credited, and not only by Senator Lito Lapid, as a defining moment in the May 29 impeachment conviction of Supreme Court Chief Justice Renato Corona. As deputy chair of the House Committee on Justice, his legal luster and gift of gab were also pivotal in the impeachment of Ombudsman Merceditas Guttierez who resigned last year before her trial could begin. 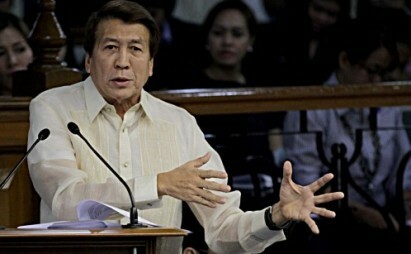 Corona’s conviction and Guttierez’s impeachment are firsts in Philippine history. Both the government and business sectors agree that 2012 was one of the best years ever for the Philippines with economic growth expected to surpass the targeted 5 to 6 percent and the stock market ending the year on a record high. Now the best performing market in Asia, next only to Thailand, the Philippines has an even rosier outlook in 2013 after finally getting investment-grade status, which is expected to draw more foreign investments into the country. The Aquino administration must be doing something right. But did you know that the country’s economic genius is from Dingras, Ilocos Norte? 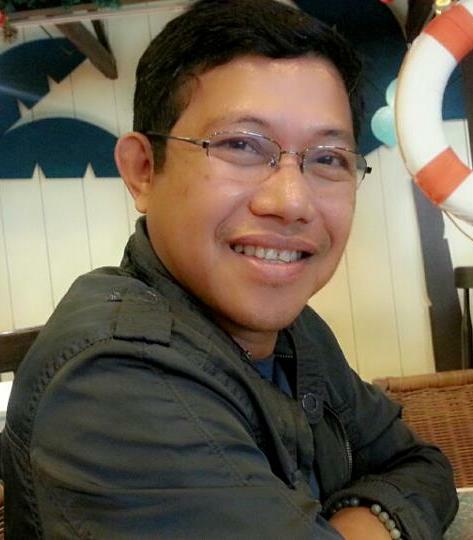 Socioeconomic Planning Secretary Arsenio Balisacan of NEDA (National Economic Development Authority) is an agriculture graduate of Mariano Marcos State University in Batac. After enjoying graduate and postgraduate scholarships in top universities here and abroad, he went to teaching. At the time of his appointment to NEDA, he was dean of the University of the Philippines School of Economics. 5. 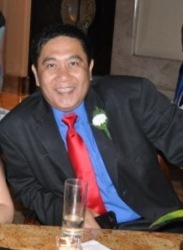 San Nicolas Mayor Alfredo “Boying” Valdez Jr. Along with his family, he deserves credit for initiating the “mall boom” in the province after he pulled all the stops to bring a big mall here. All of the other competitors soon jumped into the bandwagon with its fiercest rival mall also set to start its groundbreaking for the construction of its mall somewhere in Laoag City. On top of this, the three-term San Nicolas mayor boosted the municipality’s economy from its lower-tier position prior to his first term to now a “technically” first class municipality. In achieving this, the good mayor was given various recognitions by a multitude of organizations among which are the “The Will to Serve” award from the League of Municipalities of the Philippines and by the PCCI for being the most Business Friendly municipality, as well as the Gawad Pamana ng Lahi award. She was proclaimed one of The Outstanding Filipino Physicians (TOFP) for 2012, a search organized by the Junior Chamber International (JCI) Senate Philippines and San Miguel Corporation which aims to honor exemplary medical professionals. With the theme “Serving and caring for our countrymen are the best works of life”, Dr. Luis of Laoag City was chosen for her sterling professional record in the service of her fellow Ilocanos, including indigents, and for shunning temptations of greener pasture abroad. Though Batac is among the youngest cities in the country, it has already reaped major recognitions that older cities can only aspire for and dream of. Just recently, it was declared champion in the Regional Legislative Awards. It was earlier identified by DILG as one of the Top Ten Best-governed Component Cities in the entire country. Also, it has received the prestigious Seal of Good Housekeeping and the Gawad Pamana ng Lahi in recognition of its good governance matched by an empowered citizenry. Not bad at all for what started as a controversial and questionable city. For over two decades, he has joyfully done developmental work for young men and women of this province. Long before the “Tan-ok” phenomenon came to fashion, the Young Men’s Christian Association –Ilocos Norte Chapter, where he served as program director, had conducted annual cultural and literary festivals that brought forth the ingenious creativity of young Ilocanos. YMCA Ilocos Norte was also known for its leadership programs. “Pabs” was appointed this year as National Secretary General of YMCA Philippines. News of his appointment to the prestigious post was met with gladness by many of his former trainees. 9. 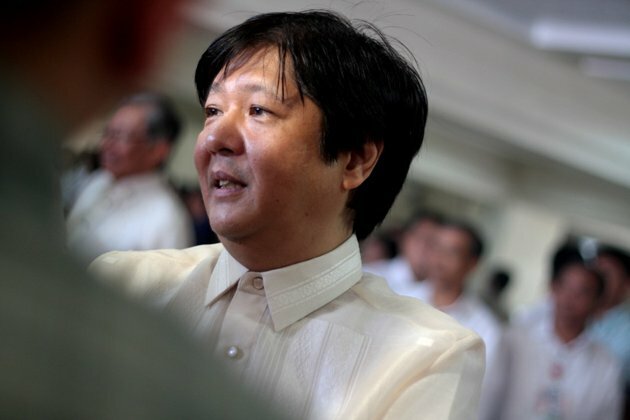 Senator Ferdinand “Bongbong” Marcos Jr. He was the only legislator from Ilocos Norte who voted in favor of the Reproductive Health Bill, a landmark legislation that languished in Congress for 14 years, mainly because of the influence of the Roman Catholic Church which is against the measure meant to guarantee universal access to methods on contraception, fertility control, sexual education, and maternal care. Located in five Northern Provinces, her stores carry famous international and national brands, but this lady is not content in simply being a retailer. As CEO of Visionaire, she created her own abel line and founded MODi (Modern Ilocana). There is a dearth of interestingly chic and fab Ilocano merchandise in Ilocos Norte, but given the visionary efforts of local entrepreneurs like Ms. Macaraeg, also president of ILEA (Ilocano Lifestyle Entrepreneurs Association), products we can proudly call our own have high hopes of penetrating bigger markets soon. With the influx of big businesses in the province, Ms. Macaraeg shows homegrown business folks how to constructively respond to, and not be daunted by, the serious challenges posed by competition. This is her greatest achievement. They give a young and vibrant face to government service. 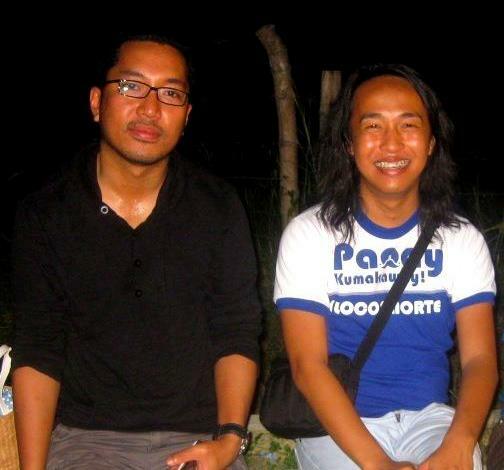 Only in their mid-20’s, this dynamic duo have become trusted lieutenants of Governor Imee Marcos: Raquel in Tourism and artistic events, and Gudoy in public information. Paoay Kumakaway, which seemed confusing at first, did work. Tourism in Ilocos Norte during the Holy Week was estimated at 680,000, marking a 356-percent leap from last year’s 191,000 over the same period. The labor of Raquel and his hardworking team paid off. Gudoy shows how a government public information office must be run in our time and age. The Capitol’s Communication and Media Team exhausts all forms of traditional and new media in an effort to get across the “Pasingkedan” message given flesh in the programs of the provincial government, both in times of cheer and disaster. The Tan-ok ni Ilocano Festival of Festivals has earned rave reviews not only from critics, but, and most importantly from the common Ilocano who, through songs and dances executed with world-class flare and splendor, realized his inherent greatness in the arts and, by induction, in many other fields. Raquel and Gudoy have played important roles in organizing many other events, with the Himala sa Buhangin held for the first time in May showing the biggest promise. Last August, news of their resignations (They are young and restless, and maybe exhausted, people thought) caused a stir, but all is well now, and even better. 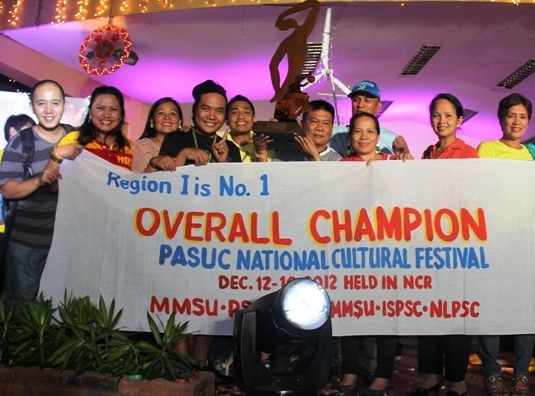 Beating all regions, especially the most vaunted NCR, was beyond their prayers and expectations, but the MMSU-led regional group bagged the overall championship in the 2012 PASUC National Cultural and Literary Olympics held in Manila just two weeks ago. Organized by the Philippine Association of Sate Colleges and Universities, it is the biggest university-level competition in the country. Of the 16 events contested, Region I bagged 6 golds, the most number obtained by any region in the league’s 45-year history. Of those 6 golds, 3 were won by MMSU students: John Vincent Toribio of Solsona in Dagliang Talumpati, Ira Canonizado of San Nicolas in Instrumental Solo, and the Nasudi Chorale in the choral competition.